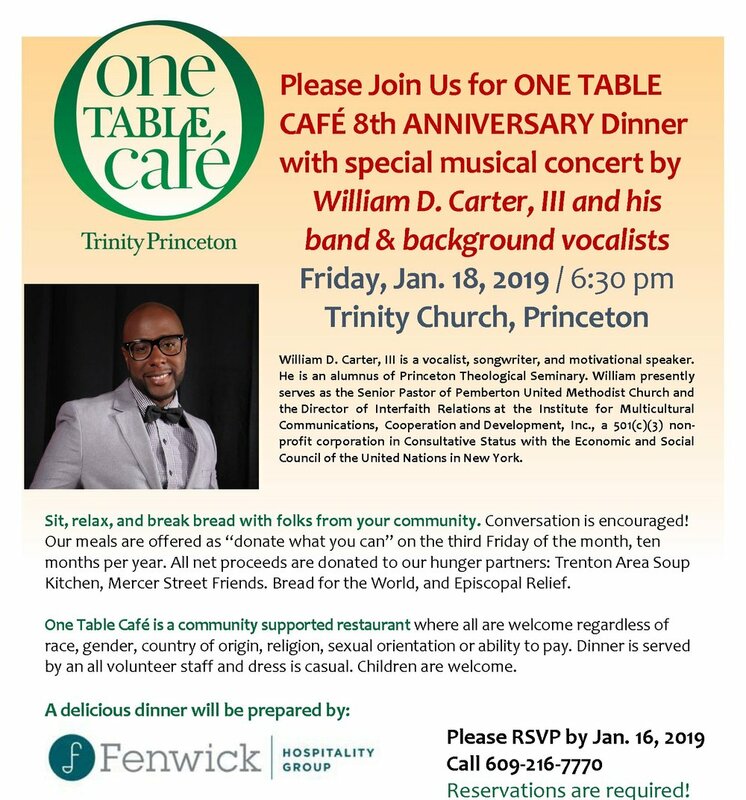 Our next One Table Café dinner is being held on Friday, January 18th at 6:30 p.m. at Trinity Church. Please join us for our 8th ANNIVERSARY Dinner with special musical concert by William D. Carter, III and his band & background vocalists. William D. Carter, III is a vocalist, songwriter, and motivational speaker. He is an alumnus of Princeton Theological Seminary. William presently serves as the Senior Pastor of Pemberton United Methodist Church and the Director of Interfaith Relations at the Institute for Multicultural Communications, Cooperation and Development, Inc., a 501(c)(3) non-profit corporation in Consultative Status with the Economic and Social Council of the United Nations in New York. A delicious dinner will be provided by Fenwick Hospitality Group. We look forward to welcoming you on January 18th.